Last year we paid our first visit to the Museum of Pinball in Banning, California, for the second ever Arcade Expo show. 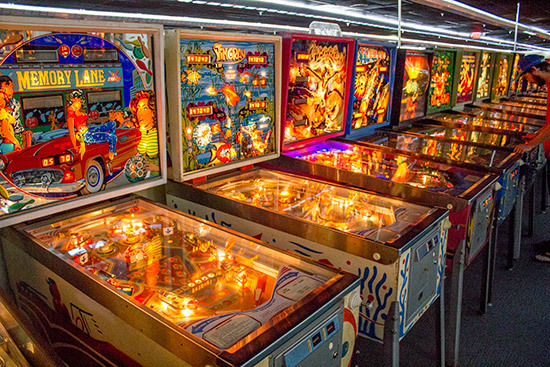 This year we are back for Arcade Expo 3.0 which has moved from the usual January slot to the busier show season of March. 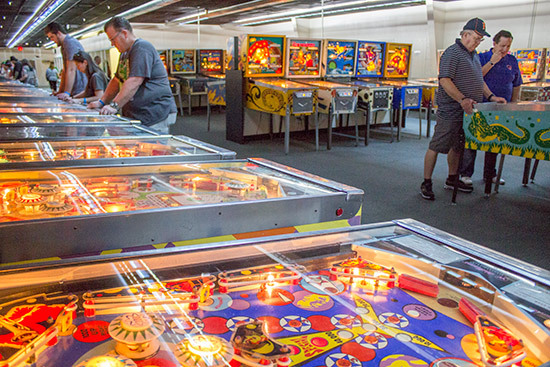 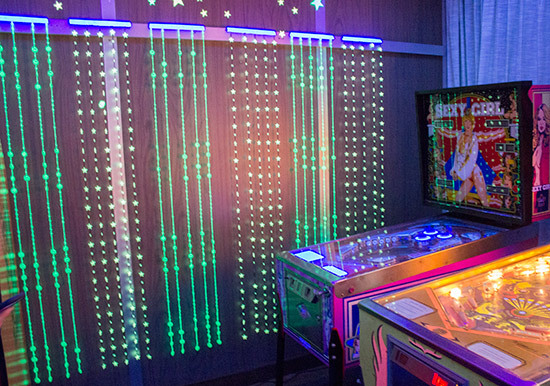 Once again, the Arcade Expo venue was the Museum of Pinball, at 700 South Hathaway in the semi-desert landscape at the base of snow-capped hills south of Banning. 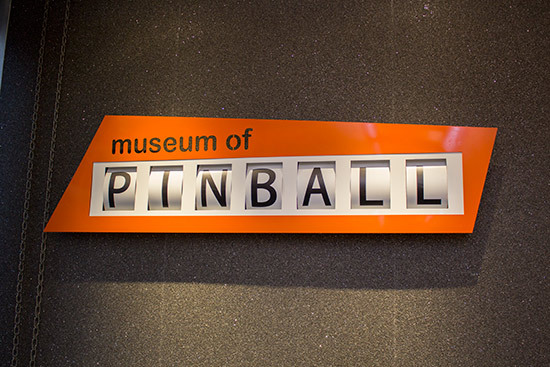 The Museum of Pinball is sited in its own compound, consisting of the main museum building and numerous satellite storage units. 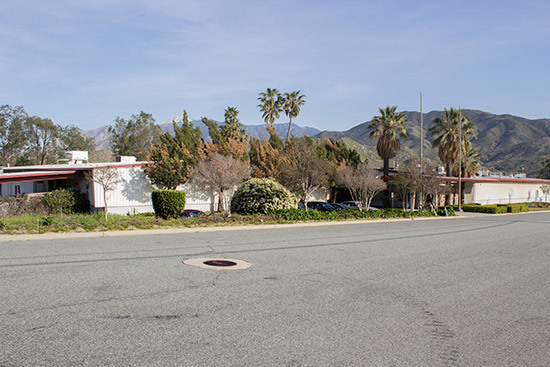 There was plenty of parking on site, both at the front of the building and elsewhere on the compound, while street parking was also an option. 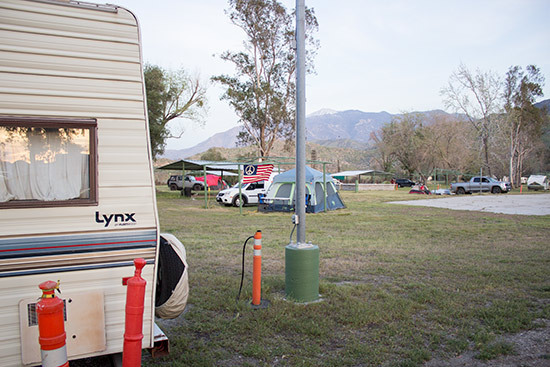 Meanwhile for the adventurous, RV parking and camping was available a short distance from the main Museum building. 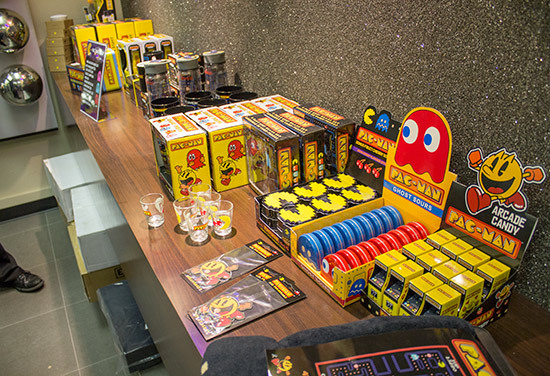 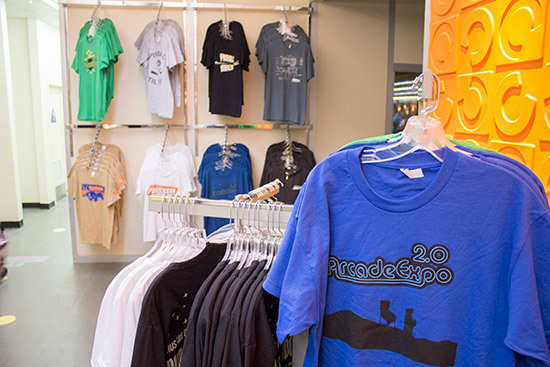 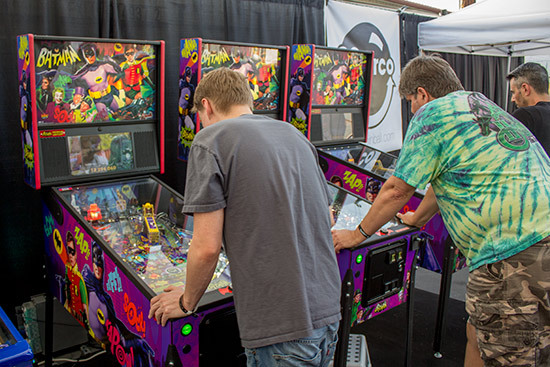 We arrived on Friday afternoon when the Arcade Expo show opened to the public. 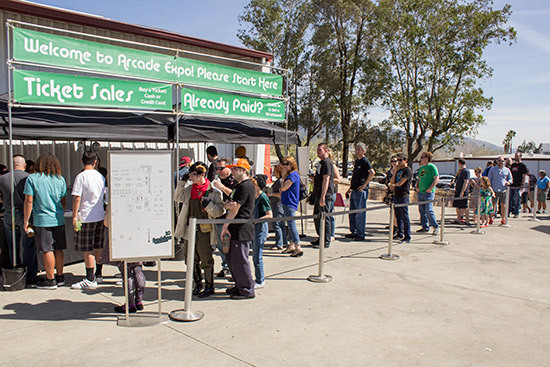 Although it was reasonably busy then, Saturday was when the most visitors arrived. 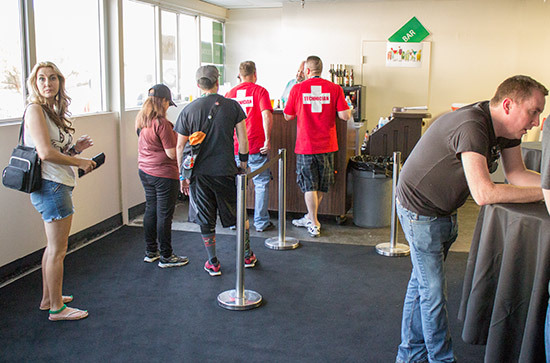 Entry cost $45 per day for the shorter Friday (2:30pm-midnight) and Sunday (11am - 7pm) sessions, or $55 for Saturday's full day (11am - 2am). 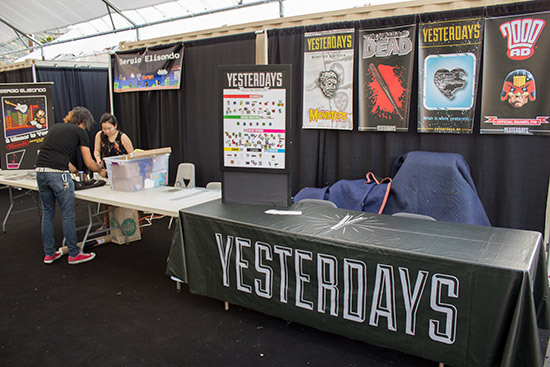 Children's passes were priced at $20 a day, while a 3-day pass costs $120 for adults or $55 for kids aged three to twelve. 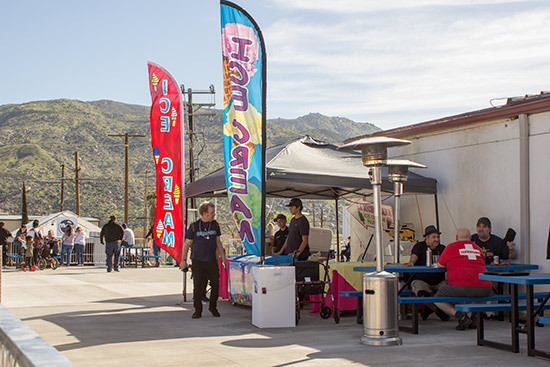 Even before visitors got into the Museum building there was plenty to see in the forecourt, from food trucks to beer and ice cream tents and vendor stalls. 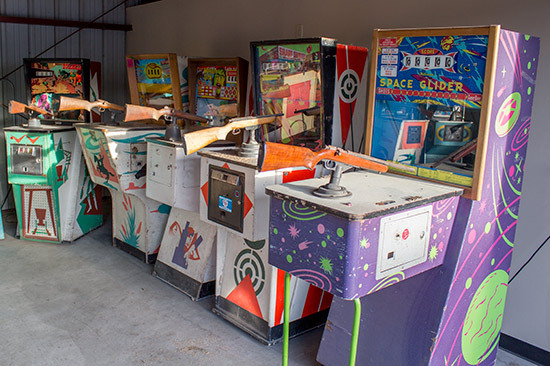 A little further along we have more stalls and some shooting games. 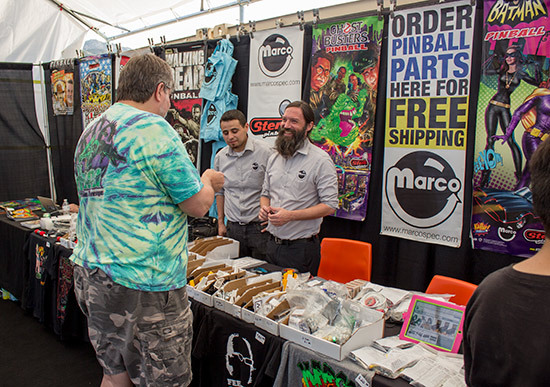 The biggest vendor by far was Marco Specialties who were showcasing the latest Stern Pinball games and also had a special guest. 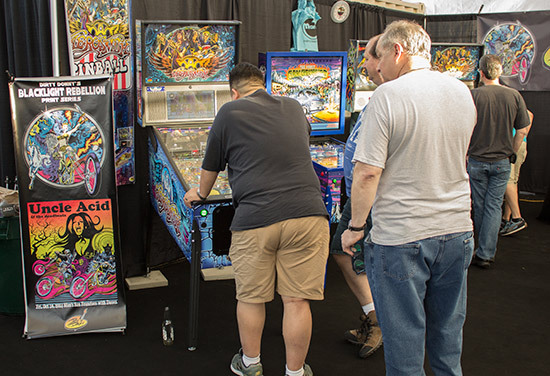 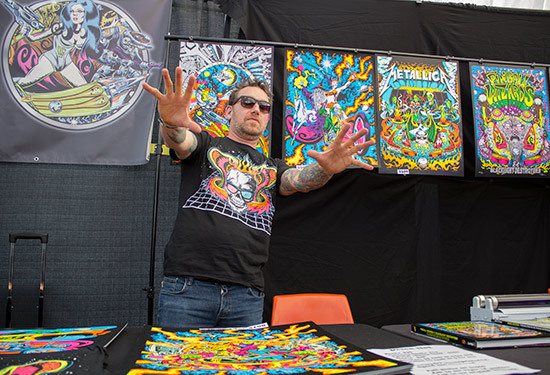 Many of the Stern Pinball games featured artwork by 'Dirty' Donny Gillies, and the man himself was here at the show to meet guests and autograph various pinball items. 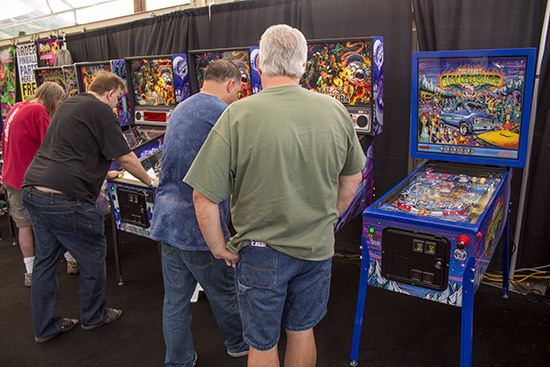 In addition to Donny and the latest games, Marco also had a selection of pinball spares on sale with their usual offer of free continental US shipping on orders made at the show. 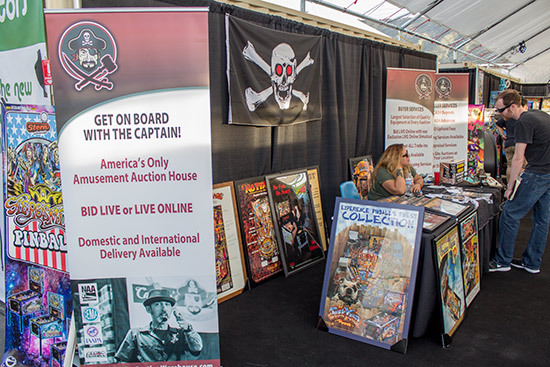 Sharing the tent with Marco were Captain's Auctions who had a stand of their own. 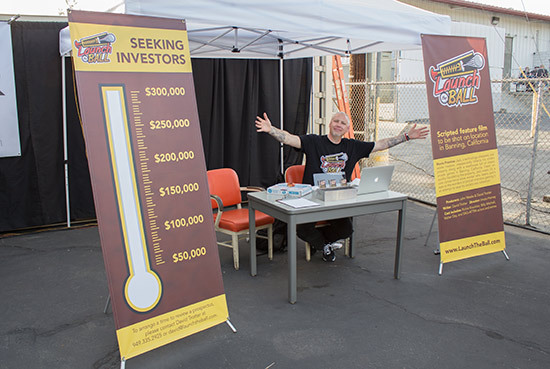 Outside the tent, the David Trotter was stoking interest in his Launch the Ball movie venture and looking to raise the necessary funds from investors. 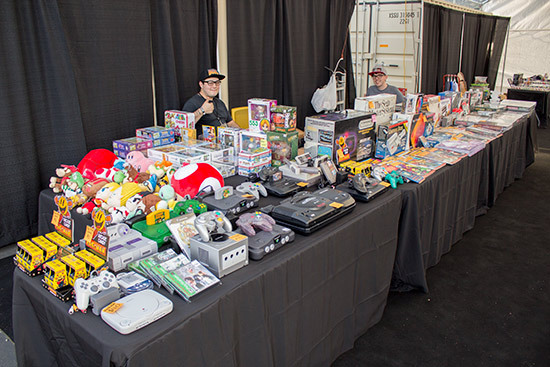 In the tent next door, more arcade vendors had their stands set up to sell assorted video game systems and trinkets. 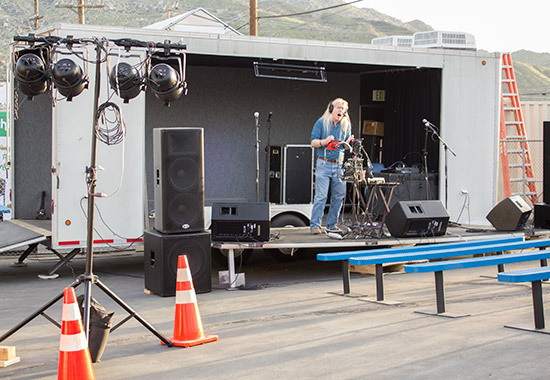 Also set up outside was a small music stage where bands and lone performers entertained guests to the show. 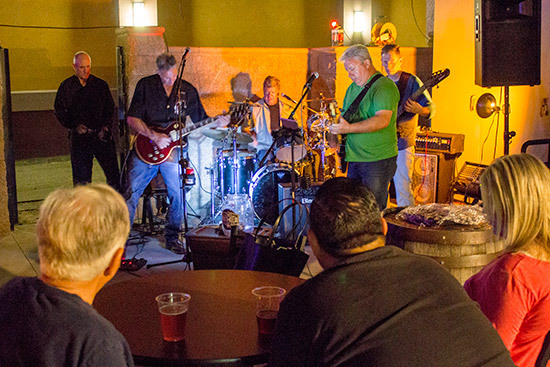 Some acts were more annoying than enjoyable, but some talented musicians also played here with the music resonating around the compound. 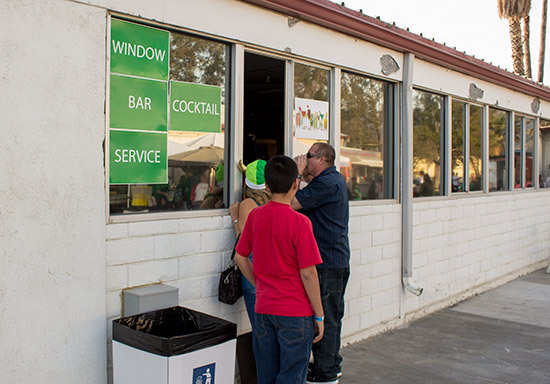 In addition to the food and drinks vendors we saw earlier, there was also a side window where visitors could purchase items from the cafeteria inside the main building without having to leave the glorious sunshine. 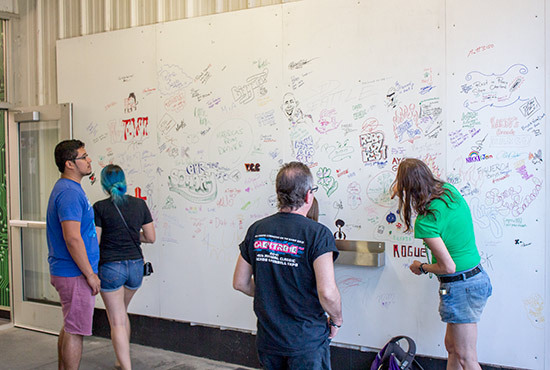 Just outside the cafeteria, at the entrance to the main building - was a large canvas where visitors were encouraged to leave their mark. 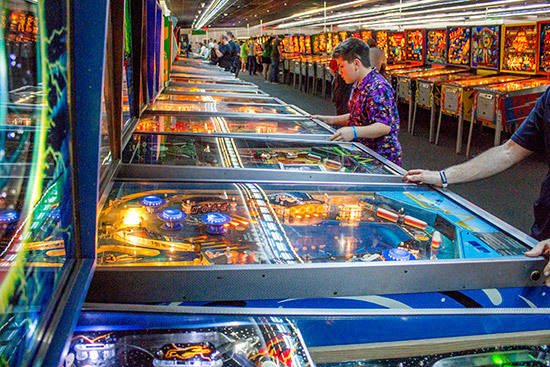 And so we come to the main part of the Arcade Expo show - the games halls. 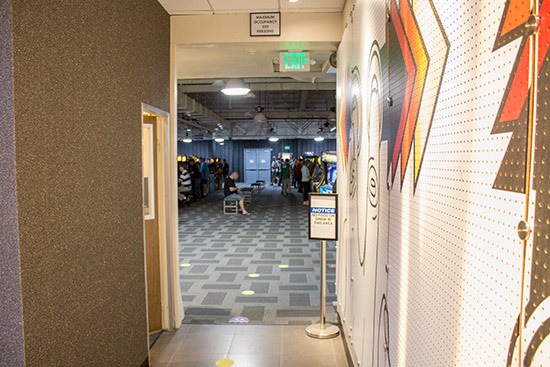 We say 'halls' because the building is split in two, with pinball machines on the left as we enter and video games on the right. 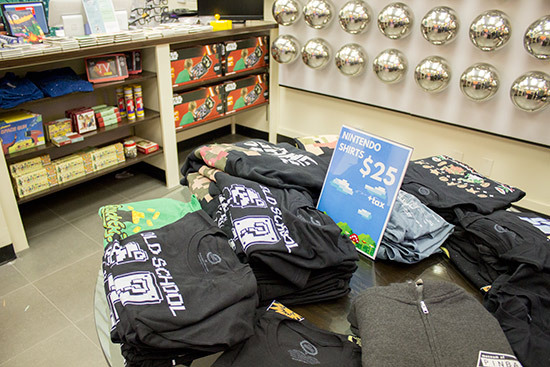 Before we get to either of those though, there's the Museum's gift shop. 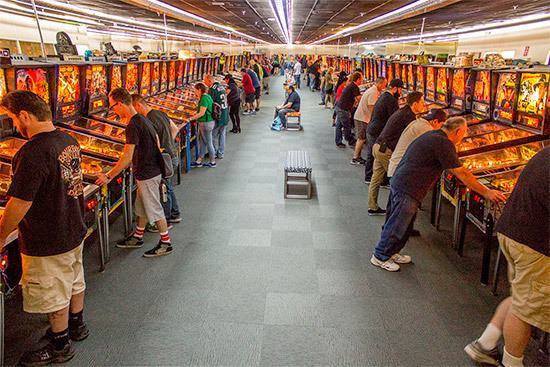 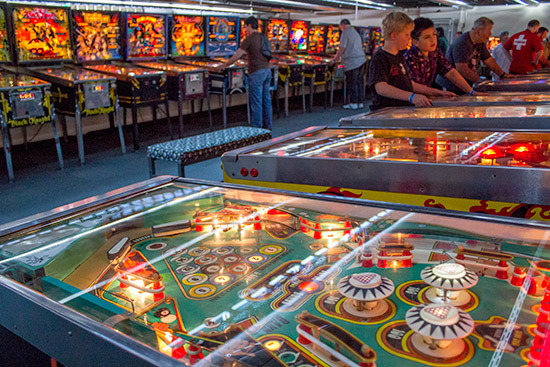 Entering the main pinball hall, we have a jaw-dropping array of machines ranging from the early electromechanical to the newest LCD screen models, arranged in rows which disappear into the distance. 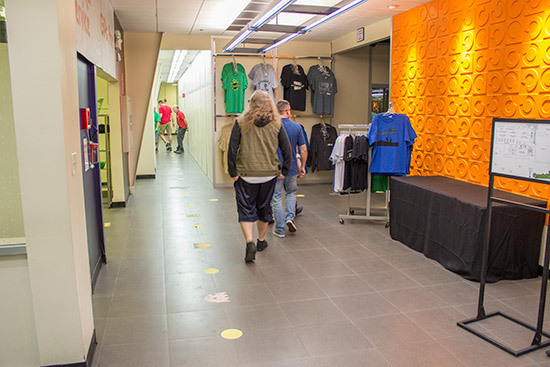 The hall is divided into sections dedicated to the various manufacturers. 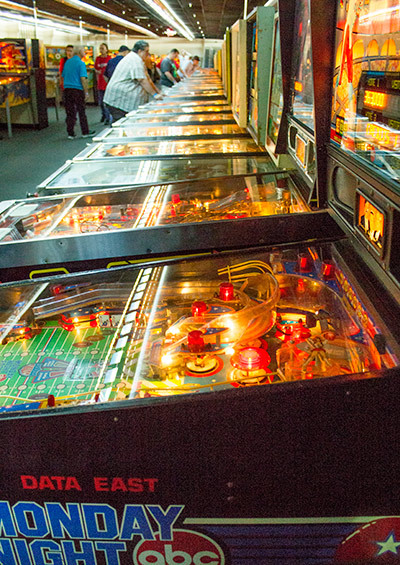 The Data East/Sega line is the first visitors get to see. 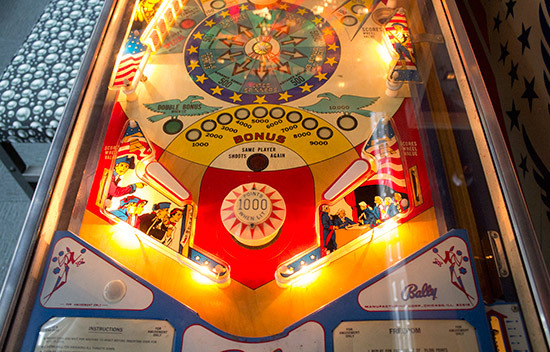 There is also a dedicated area for Bally electromechanical games, with one row of wedgeheads and another of Gottlieb EMs. 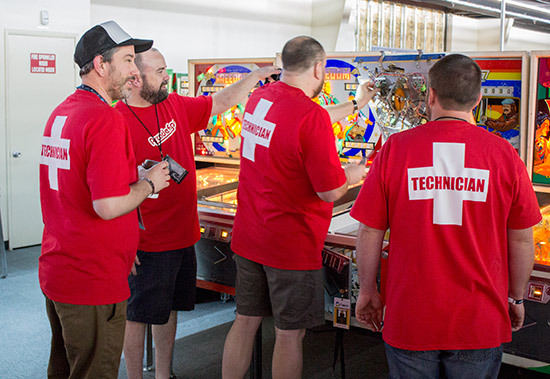 Keeping all these games up and running takes a veritable army of hard-working tech volunteers. 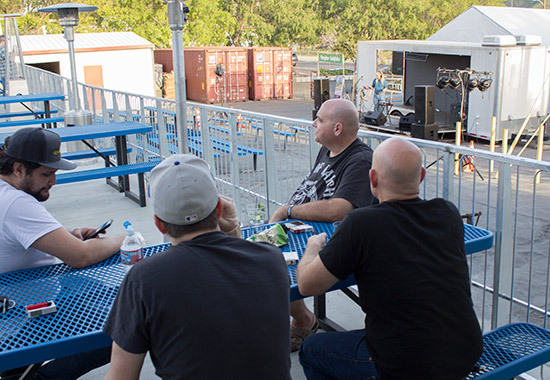 They were easily identified by their distinctive red T-shirts. 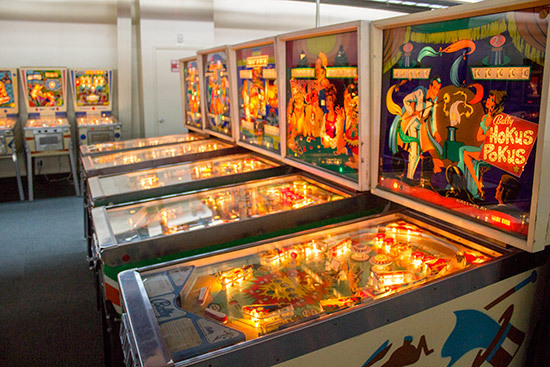 Elsewhere around the pinball hall, various clusters of games are grouped together by manufacturer or according to another common theme. 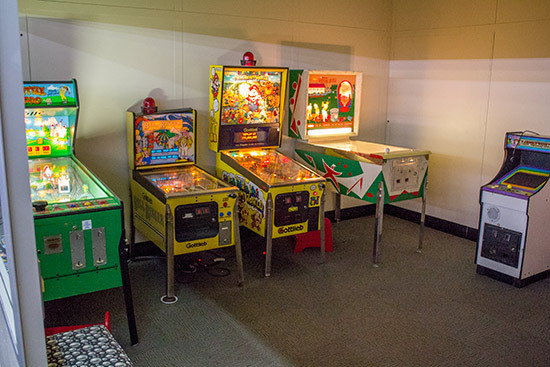 In the very back corner of the pinball hall is an area dedicated to tournament play. 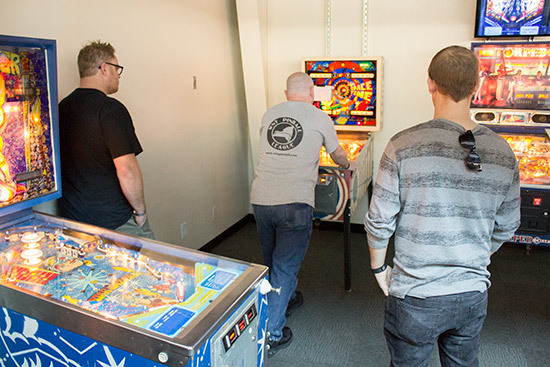 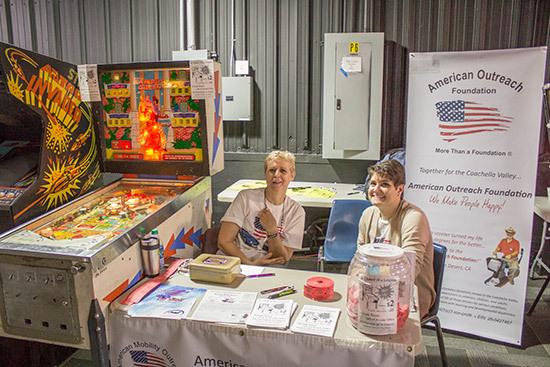 This weekend there were various pinball tournaments - both IFPA-accredited and not - contested in the area. 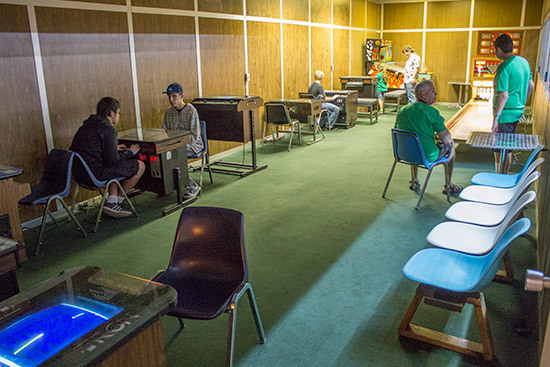 There were also two side rooms - one with games just for the younger visitors, and another lounge with table-top games and a ball bowler. 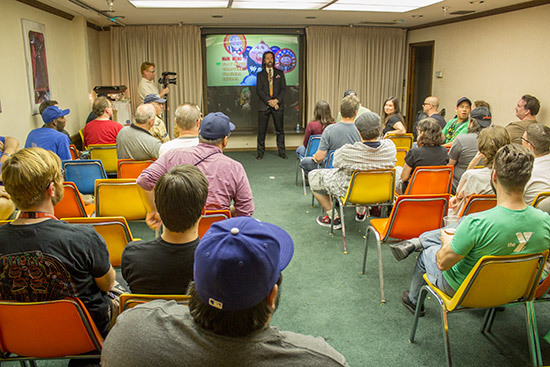 Here's our exclusive Thirty Minute Tour video of the show. 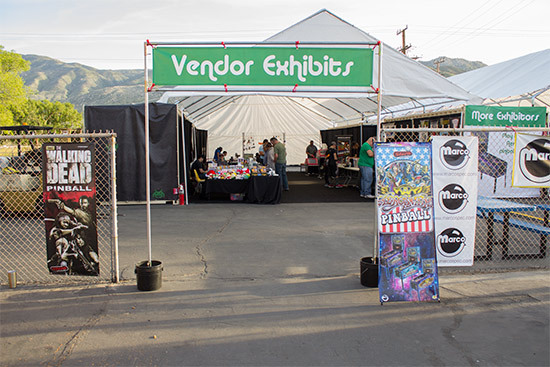 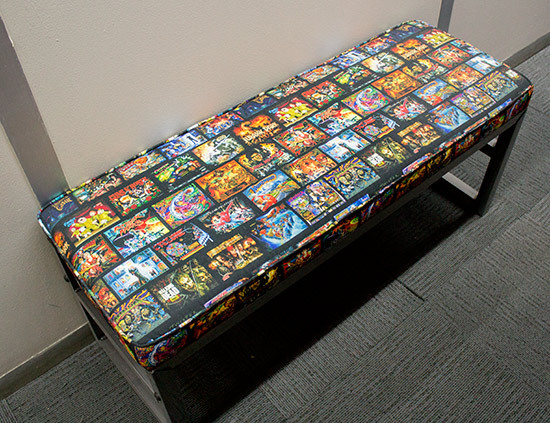 This skips the video games hall - we have a separate video of that - but covers everything else, including the stands outside and in the vendor area. 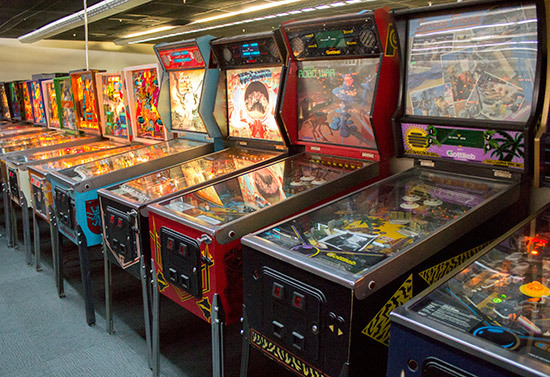 The video game hall there were hundreds of arcade games including all the classics and many rarer titles. 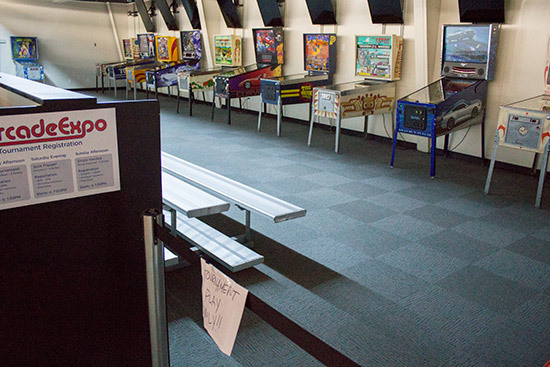 You can see them all in this Fifteen Minute Tour of the video game hall. 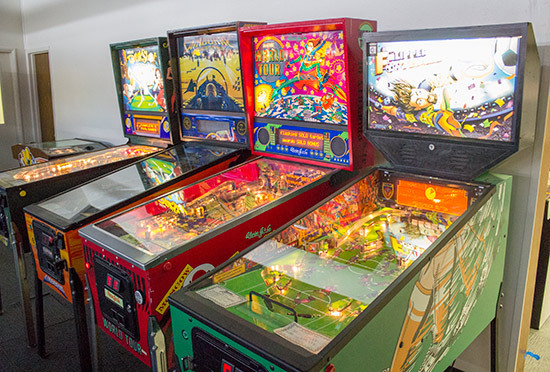 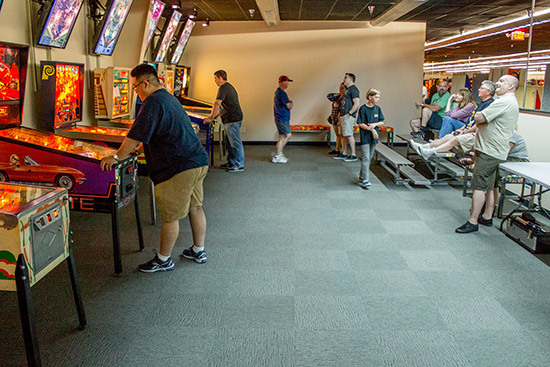 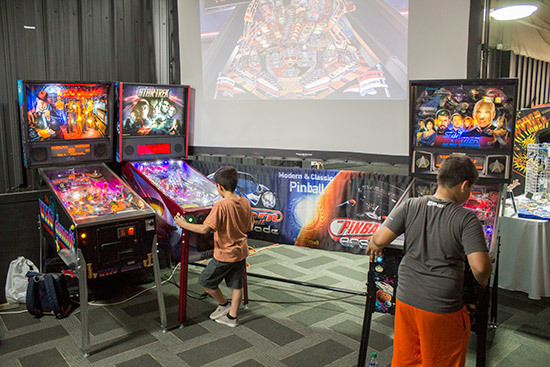 There were also a few physical pinballs to be found in the video hall, including three on the Pinball Arcade stand and another at the American Outreach Foundation. 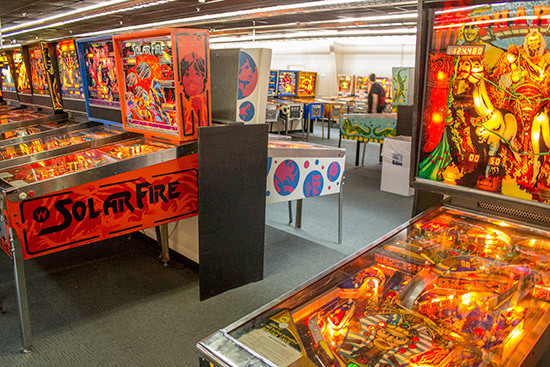 Starship Fantasy also had a large stand filled with their regular assortment of pinball plastics, ramps, backglasses and playfields. 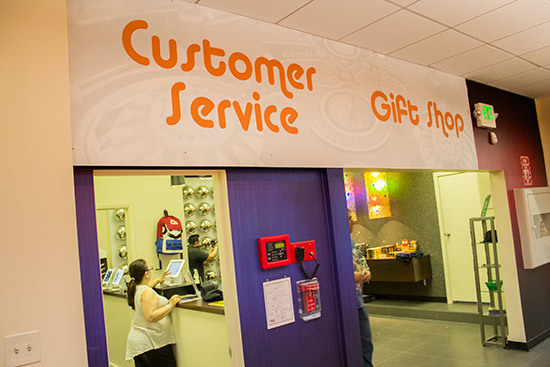 You can see all they had in our video above. 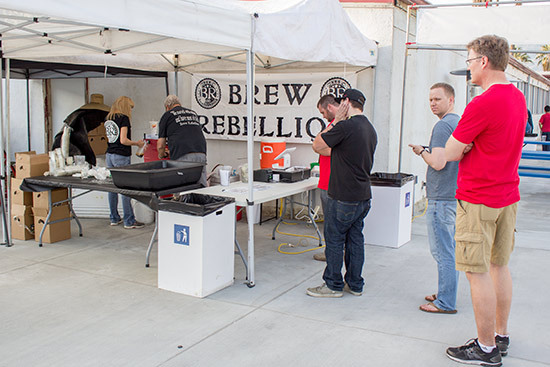 On Saturday there were two more events of note. 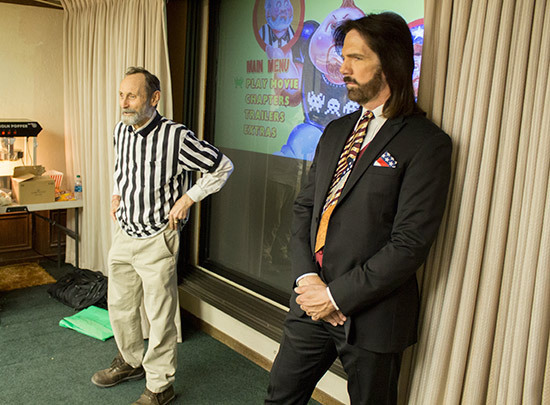 In the Trading Card Hall of Fame, Walter Day and Billy Mitchell were hosting several talks and Q&A sessions, as well as unveiling the latest trading card subjects. 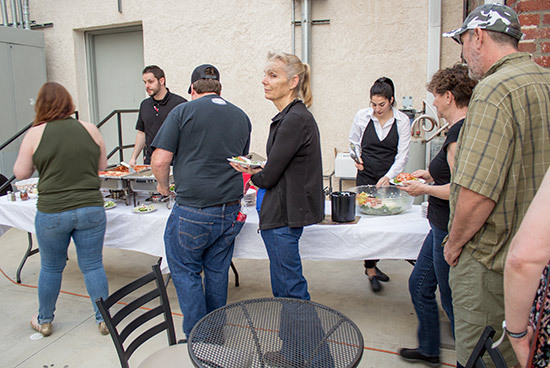 Then, on Saturday evening there was a special VIP meal to unveil Tim Moyers latest restoration. 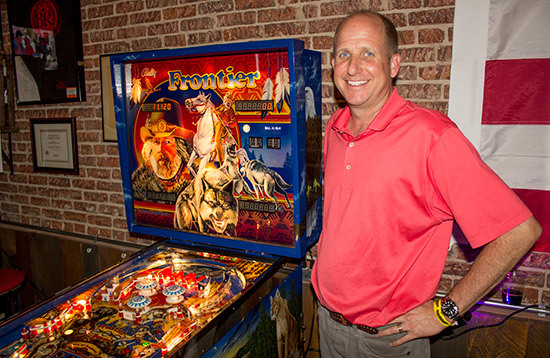 After last year's Getaway, Tim returned to Arcade Expo with a Frontier. 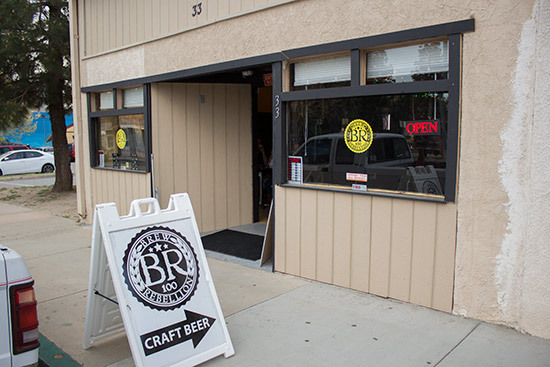 It was revealed at a party in the Beer Revolution taproom in Banning. 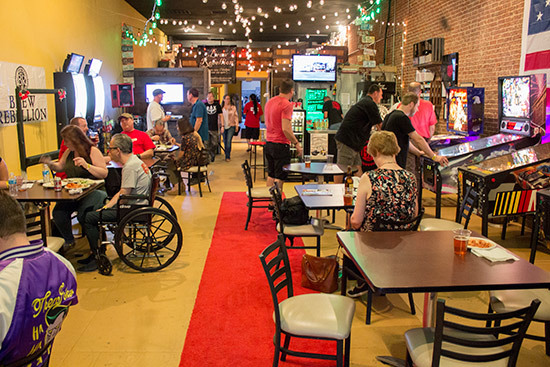 Entry to the VIP party cost $40 per head and included free drinks and food. 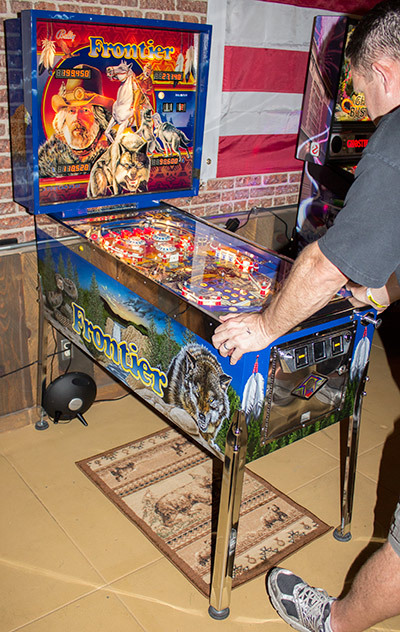 Inside, five pinballs were set up; Frontier, Ghostbusters, NASCAR, Big Buck Hunter and Iron Man. 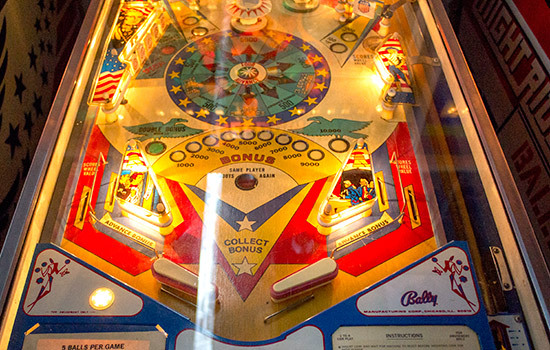 Frontier was on free play, but the others were coin-operated. 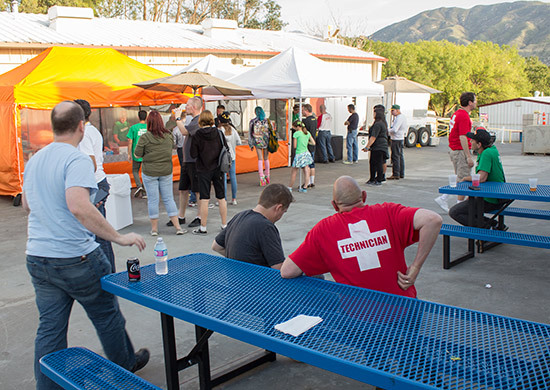 Once everyone had had the chance to try the game, food was served on the patio. 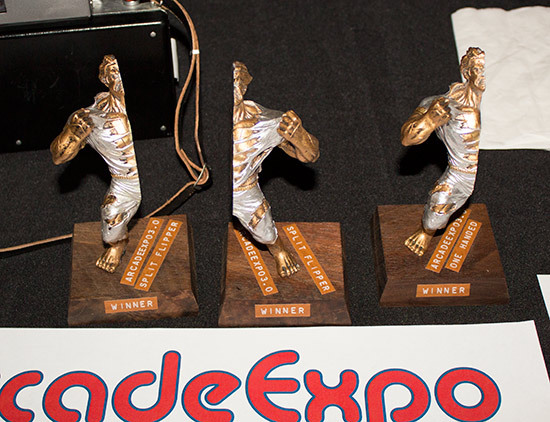 And that brings us to the end of our coverage of this year's Arcade Expo show. 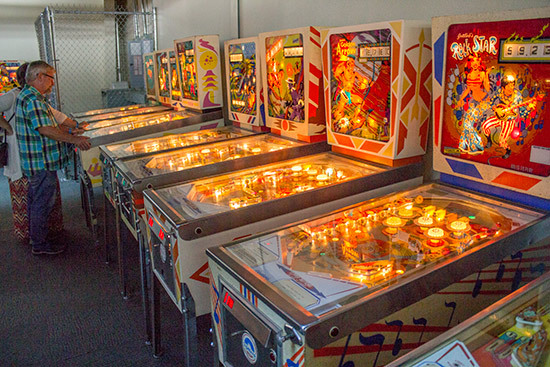 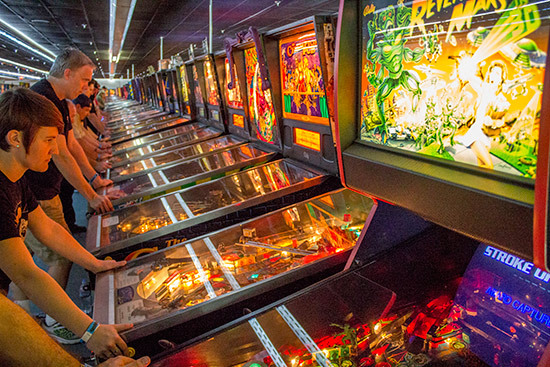 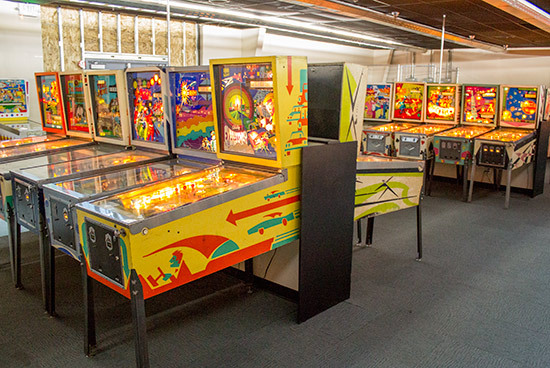 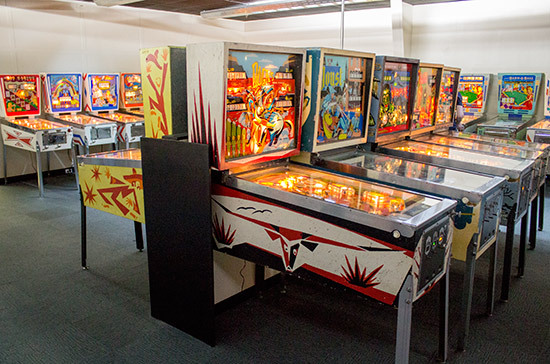 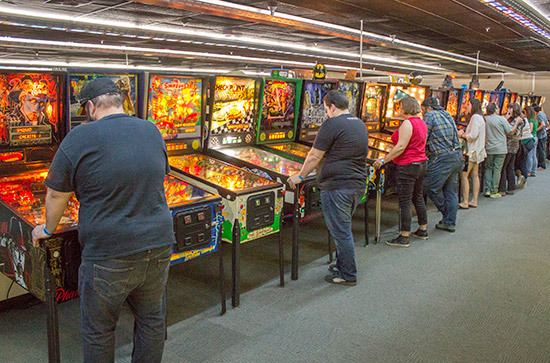 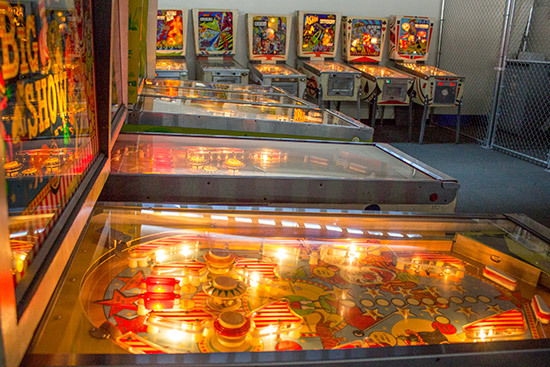 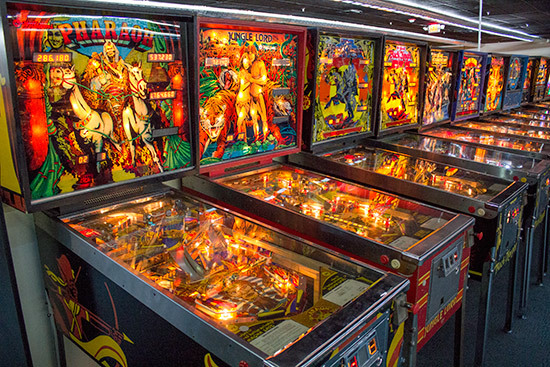 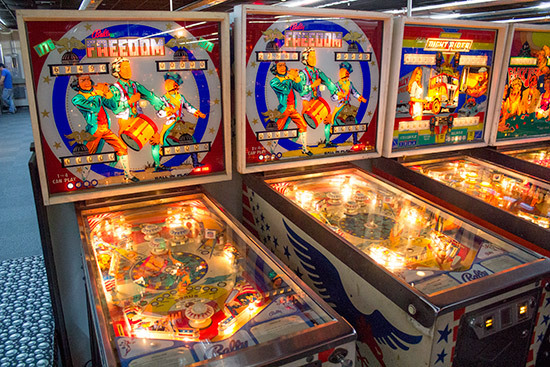 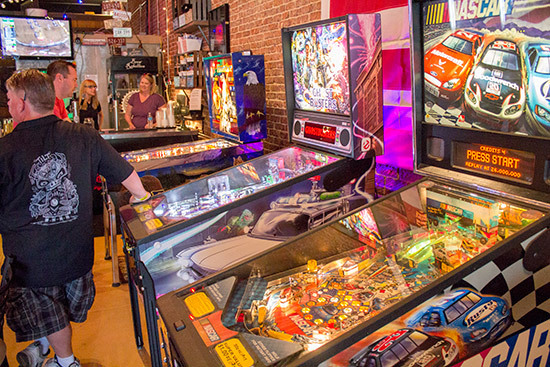 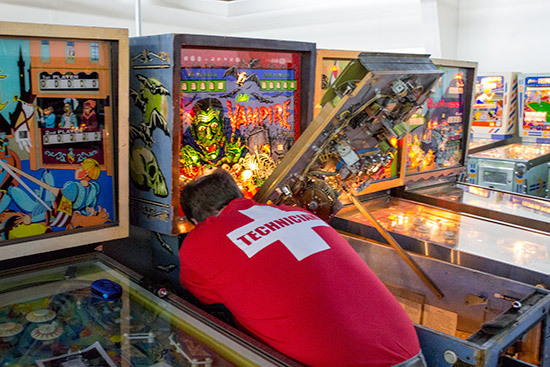 The Museum of Pinball has an amazing and unrivalled collection of pinball and video games, and gives the perfect basis for a large show such as Arcade Expo. 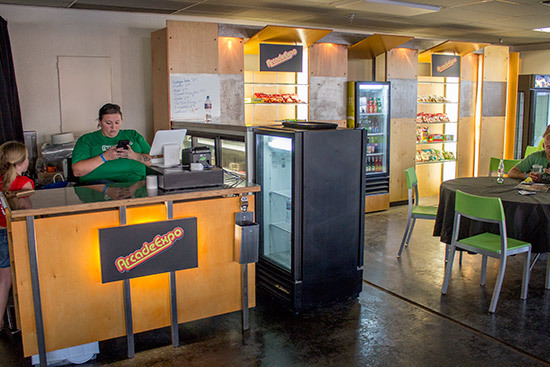 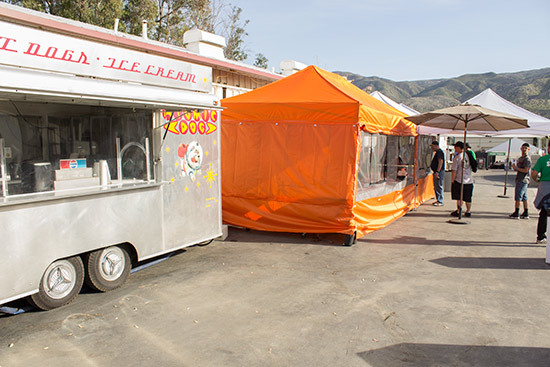 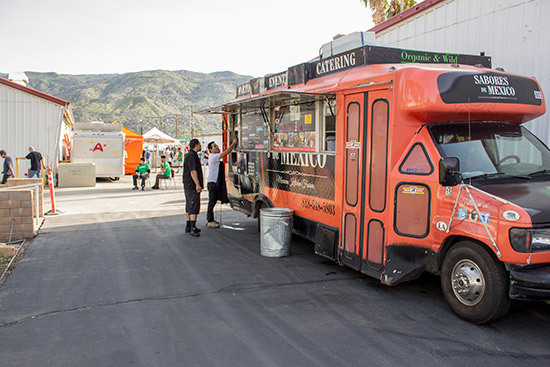 The space available both inside and out means plenty of machine, parts, collectibles, food and drink vendors can be accommodated. 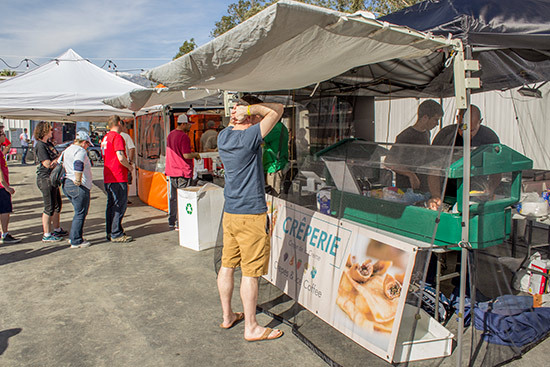 This year's hot sunny weather was especially helpful in getting guests to explore all corners of the compound. 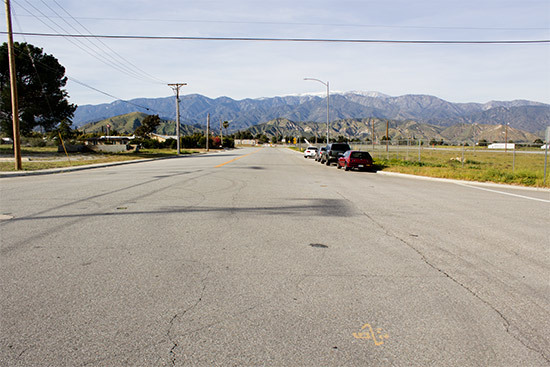 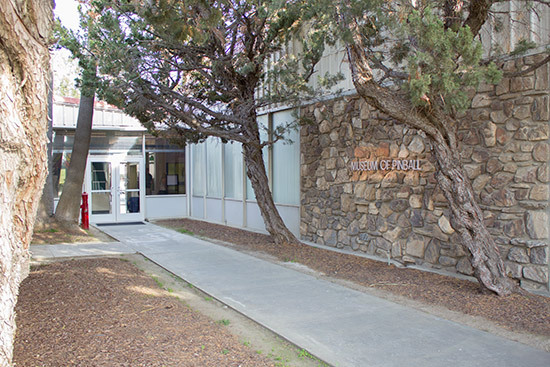 The Museum's remote location can't be ignored though, and the distance from the Los Angeles metropolitan area (combined with the lane closures on the main freeway) must act to deter the more casual attendees, as did the price of entry. 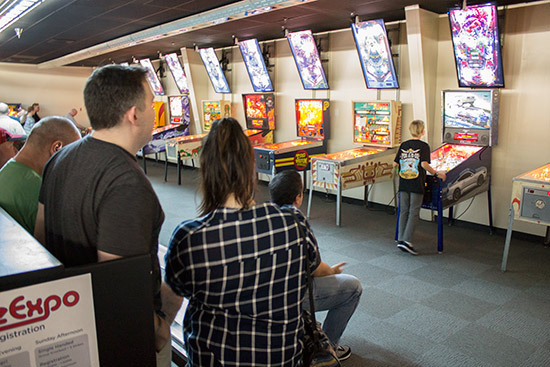 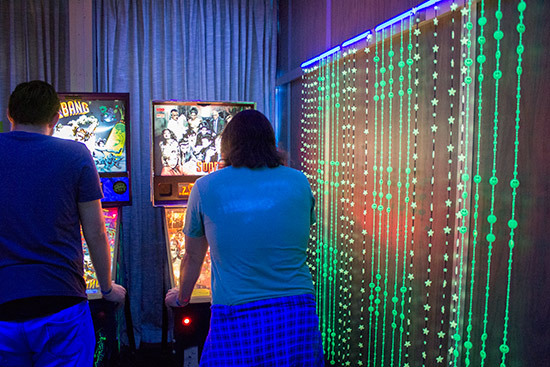 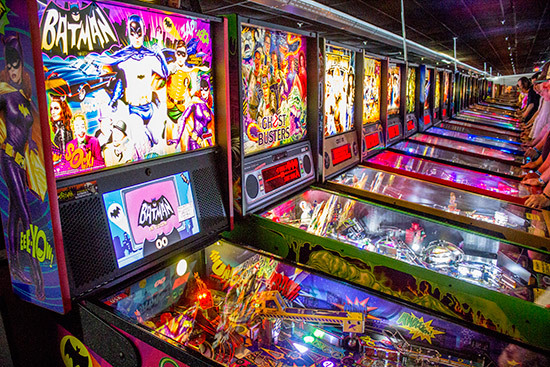 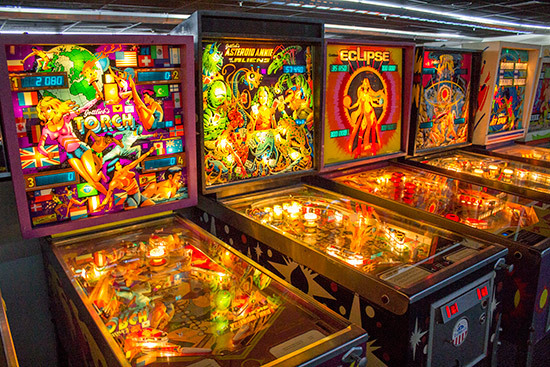 $55 per person for Saturday appears high but is actually pretty good value when you consider the number and range of both pinball and video games available to play from 11am until 2am. 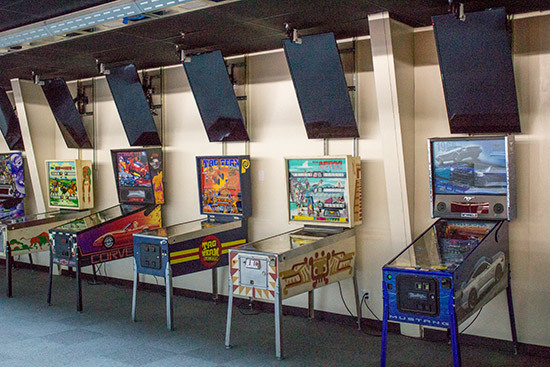 It is, though, probably high enough to deter any families with only a casual interest in arcade games. 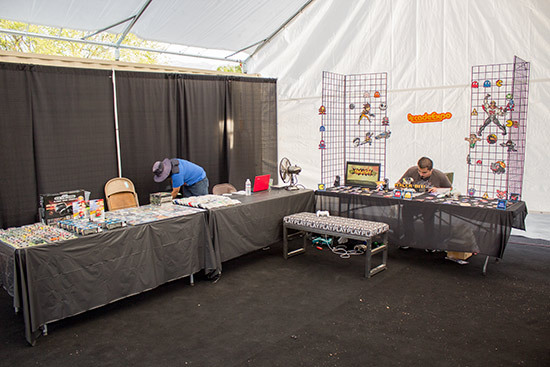 Not that that seemed to affect numbers too much, especially on Saturday - the busiest of the thee days. 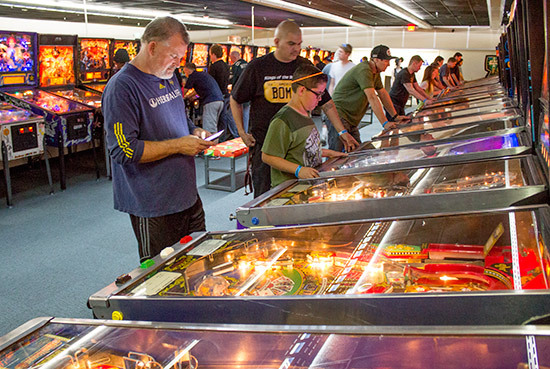 We would like to see more seminars from local pinheads. 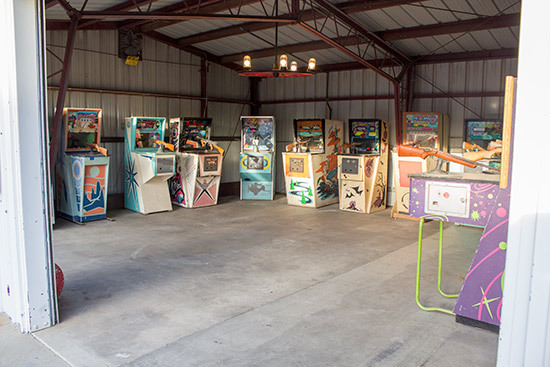 Last year's Archer talk was a unique feature of this show, and there are surely plenty of local collectors and developers who would be willing to share details of their work.